Research demonstrates that wind power could generate all the world's electricity needs without large atmospheric effects. 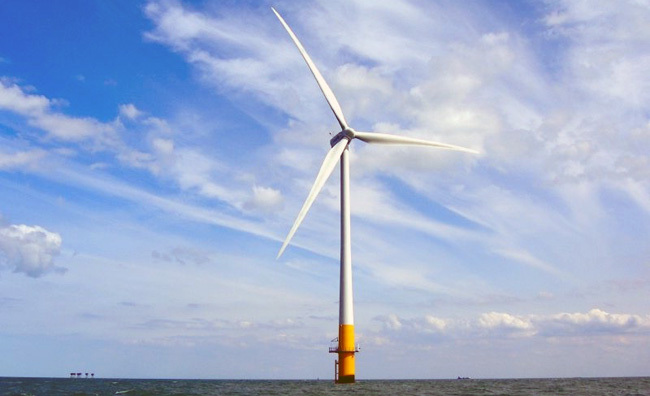 An offshore wind turbine, part of the London Array wind farm site, located in the outer Thames Estuary, about 70 miles east of London. (Inside Science) -- There is enough energy for people to reap from the wind to meet all of the world's power demands without radically altering the planet's climate, according to two independent teams of scientists. To learn more, climate scientist Katherine Marvel at Lawrence Livermore National Laboratory, in Calif., and her colleagues developed a global climate model that analyzed how wind turbines would drag on the atmosphere to harvest energy from winds at the planet's surface and higher altitudes. Historically, people have built wind turbines on the ground and in the ocean, but research suggests kite-borne turbines could generate more power from steadier, faster high-altitude winds. Adding wind turbines of any kind slows winds, and Marvel and her colleagues found that adding more than a certain amount of turbines would no longer generate more electricity. Still, their simulations suggest that at least 400 terawatts -- or 400 trillion watts of power -- could be generated from surface winds, and more than 1,800 terawatts could be extracted from winds throughout the atmosphere. In comparison, people globally currently use about 18 terawatts of power. Simulating a century's worth of amped-up wind-energy production suggests that harvesting maximum power from these winds would have dramatic long-term effects on the climate, triggering major shifts in atmospheric circulation. "However, it's important to understand that these amounts are far, far bigger than current or projected global energy demand," Marvel said. In contrast, extracting enough wind energy to satisfy current global power demands would only have minimal climate effects, as long as wind turbines were spread out. Doing so might affect surface temperatures by about 0.1 degree Celsius and affect average precipitation by about 1 percent. Independent from Marvel's research, atmospheric scientist Mark Jacobson at Stanford University in Calif. and wind power researcher Cristina Archer at the University of Delaware, in Newark, used a 3-D computer model that analyzed interactions between the atmosphere, land and oceans on a global scale, including factors such as chemistry and water-vapor content. They estimated the amount of energy turbines with hubs located a conventional height of 330 feet off the ground could extract, based on manufacturer data on how turbines convert wind to power. They also simulated turbines 6 miles above the ground, the typical altitude of the jet stream. They found the amount of wind power available at the height of most modern wind turbines before the point of diminishing returns is about 80 terawatts on all continents minus Antarctica and near their shores, and more than 250 terawatts if wind turbines could be placed across the entire surface of the planet, including the oceans. At heights of the jet stream, about 380 terawatts appears available. The numbers of both teams are not exactly comparable, in part because Jacobson and Archer looked at extracting energy at specific heights in the atmosphere, whereas Marvel and her colleagues looked more at the atmosphere as a whole. "The two teams obtained similar conclusions using two different approaches, which gives us even more confidence about our results," Archer said. More realistically, Jacobson and Archer found that 4 million 5-megawatt turbines operating on the planet's surface could supply as much as 7.5 terawatts of power without significant negative impacts on the climate. This is more than half the world's power demands in 2030, optimistically assuming that all energy is converted to clean energy by then. The researchers suggest half these turbines be placed in the ocean, while the others would require a little more than 0.5 percent of the Earth's land surface -- about half the area of Alaska. Virtually none of this area would need to be used solely for wind, but could for instance also serve as farmland, ranchland or wildlife preserves. Spreading out these ground-based turbines in windy locations worldwide such as the American plains and the Sahara would increase efficiency by keeping them from stealing wind energy from each other, and would reduce their overall environmental impact. Both these models assume wind turbines can be installed anywhere and everywhere, without regard to social, environmental, or financial considerations, such as how much 4 million wind turbines might cost, or how so many turbines might impact migrating birds. While these researchers focused on the global climate effects of very large-scale wind power, more study is needed. Archer said the findings suggest that even heavy use of wind power is likely a smart, safe and clean way to generate energy. "There is still a lot of interesting work to be done on local and regional climatic consequences of wind," Marvel said. Marvel and her colleagues detailed their findings online Sept. 9 in the journal Nature Climate Change. Jacobson and Archer published their research online Sept. 10 in the journal Proceedings of the National Academy of Sciences. Both teams will present their work at the Airborne Wind Energy Conference on Sept. 11 and 12 in Hampton, Va.